Kellyann Burns’ hard-edged, geometric abstract paintings are created by stacking flat layers of color, one on top of the other. Pigment is pulled or scraped across the panel with a metal spatula, leaving masked and dripped pigment as evidence of her process. 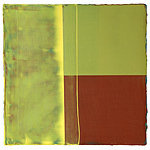 The edges of her work reveal the history of accumulated layers of color and the paint buildup is left exposed. Burns considers sandpaper to be as important a tool in her process as brushes and pallet knives, as every layer of paint is sanded. This allows previous layers of pigment to be exposed within fields of solid color through varying intensity and pressure. Additionally, sanding allows a smooth, lustrous, and dense surface to be created. Some areas become matte and translucent while others, in contrast, are glossy and opaque. Because of these qualities, Burns is able to manipulate subtle changes of light both within, and reflecting from, her richly-colored oil paintings. For Burns, her work addresses the relationship between physical space, architecture, and the intimacy of the perceptual experience of the painted image. She notes that she is “drawn to the beauty of erosion, how attrition and regeneration in the natural and man-made world evokes both the reductive and the expressive.” By emphasizing a layered process, she deliberately alludes to the passage of time, while the geometry of the shapes within her work resembles three-dimensional structures flattened and compressed to a two-dimensional plane. The physicality of her working method is considered by the artist as being akin to a sculptural process. In fact, she continuously turns her panels while she is working on them, shifting their polarity and questioning their center of balance. Burns feels her work is complete only when it can be successfully viewed in each of its four rotations.